If you think you are eligible for the State Government’s cost of living payment for people on low incomes, you need to apply before 31 October. Homeowners and retirement village residents on low or fixed incomes can receive the payment to help with expenses such as utilities and council rates. It is indexed annually and this year’s payment is up to $202.70 for homeowner-occupiers and $101.40 for tenants. 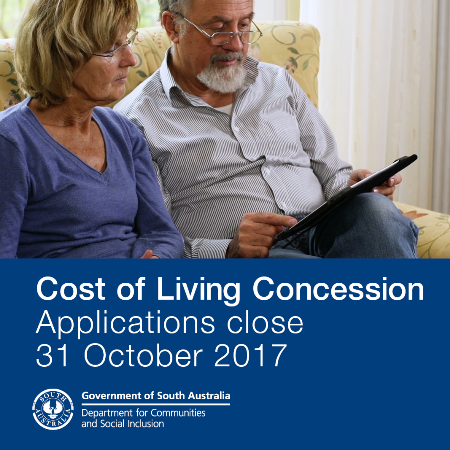 Applications for the 2017-18 Cost of Living Concession close on 31 October. Eligible homeowners will receive the payment by the end of 2017 and eligible tenants by the end of March 2018.